Are All Homes Selling Quickly? Everyone hears about homes selling in a few days, often with multiple offers, and sometimes bidding above list price. Just reading those titillating headlines in social media could lead the public to believe all houses are selling quickly. The luxury housing market is very different from mainstream real estate markets. 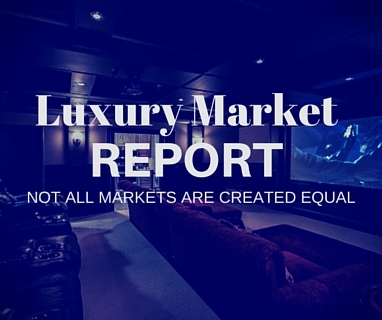 The supply of luxury priced homes exceeds the demand, which is causing prices to decline. Volatile global economies and fluctuations in the stock market are also contributing to less demand for luxury homes, including second homes. This decline has been fairly consistent across the U.S., including in Cherokee County. The luxury home market is considered the top 5% of a market, which is $750,000+ in Cherokee. In the $750,000+ luxury market, comparing the first four months of 2016 vs 2015, the year over year number of sales in Cherokee County has declined 30%. The year over year average luxury sales price in Cherokee has declined 15%. In contrast, the market below $750,000, has seen year over year improvement. The number of sales in the under $750,000 market has increased 15.7% and the average sales price has increased 4% in Cherokee County. In the $750,000+ market, there are currently over 60+ active listings in Cherokee County. With an average sales rate in this price point of 2.75 homes per month, that means the absorption rate is 24.7 months. In other words, it would take over two years for all the homes currently listed for $750,000 or more in Cherokee County to sell, if no other homes are listed for sale. The oversupply of higher priced homes will result in continued downward pressure on luxury home prices, longer days on market, and more homes coming off the market, unable to sell. A balanced absorption rate is 3-5 months. The supply and demand in the under $750,000 market is much healthier, at just over a 3 month supply. What does this mean for Luxury Home Sellers? For sellers who are downsizing, they will often be trading one investment that is declining in value for an investment that has a better financial outlook. Based on historical appreciation and demand for various price points, it can be financially better to own a $500,000 home than a $1 million home. When considering carrying costs of a mortgage, taxes, insurance, utilities, and maintenance, it rarely makes financial sense to try and wait until the market values increase to sell. The cost to hold a luxury home almost always outpaces the rate of appreciation. In many cases, it makes more sense to cut losses, and move on. Sellers have to be more aggressive in pricing realistically and use a real estate seller specialist who uses creative marketing like aerial drone video and photography in order to capture the attention of the limited number of buyers for this price point. Nothing shows off a one of a kind dream home with acreage or a lakeside setting or an amazing resort style backyard better than a view from above! What does this mean for Luxury Home Buyers? For buyers, this is a great time to buy a dream home. Prices are reasonable, and interest rates are low. The metro Atlanta economy and long term growth outlook are strong. It’s important to work with a buyer specialist who knows the local community and market and can provide the professional guidance needed for such an important decision. Whether the desire is for a primary or vacation home, an acreage or urban setting, or with water features like a lakeside setting or pool, it is a great time to fulfill that dream!